Yellow-breasted Bunting (Emberiza aureola) is a small passerine which migrates over 8000 km twice a year between its breeding sites and wintering sites in Asia. Due to over-exploitation, habitat loss and other threats, their numbers have plummeted in the past 15 years. Therefore, they are listed as “Near Threatened” by the IUCN in 2004, then “Vulnerable” in 2008, further uplisted to“Endangered" in 2013, and even to "Critically Endangered" in 2017. If we cannot revert this trend, they may become the next Passenger Pigeon and will extinct in the foreseeable future. In addition, the dismal situation which Yellow-breasted Bunting is facing implies to other species using the same habitats. This little bird mainly feeds on rice and other grains during non-breeding seas, hence it got another local name "Rice Bird". 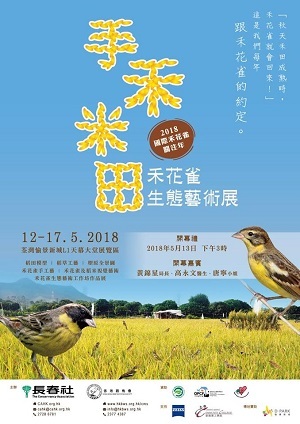 Since 2005, Hong Kong Bird Watching works with local NGO partner, Conservancy Association, to restore paddy field in Long Valley, Hong Kong, just to attract the Rice Birds and other birds using similar habitat. We grow rice and created a bird-friendly habitat suitable for them, and we saw more and more Yellow-breasted Bunting were attracted to the temporary home we made for them. To voice out the message of conservation importance of the Yellow-breasted Bunting, we are going to organize an exhibition introducing this critically endangered bird, Yellow-breasted Bunting, so as to let the general public to understand the situation of this "Rice Birds", which people were once familiar with. On display are artworks by local artists, art students and participants from the general public of workshop series “Yellow-breasted Bunting Eco-art education”. Through the artwork, we would like to promote the importance of biodiversity, with the theme of Yellow-breasted Bunting. We are also keen to raise the awareness on sustainable agriculture and nature conservation in Hong Kong.